Since I had the weekend off, I naturally decided to make some bread! 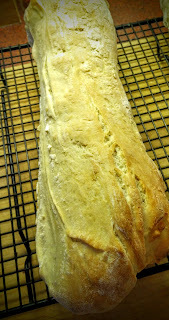 I spent about an hour reading the book and felt I was well prepared to try my hand at making Ciabatta bread. Bread-making is a lot like soap-making; it requires patience. 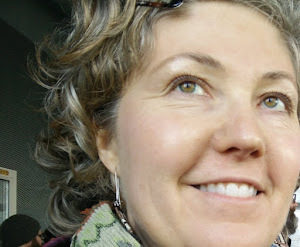 The end product is not produced within minutes, or even hours. In this case I began by making a poolish starter (pictured), a wet sponge-like dough that ferments for at least a day. 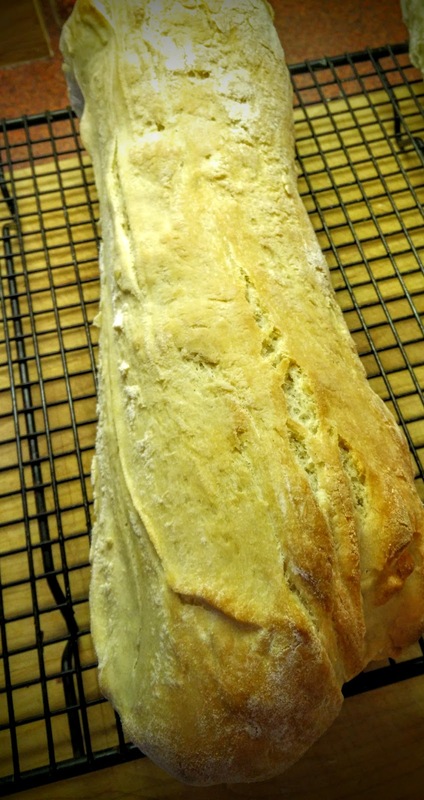 Using a starter for bread-making creates better flavor and texture. A biga is anther type of starter; it is not as wet as the poolish. 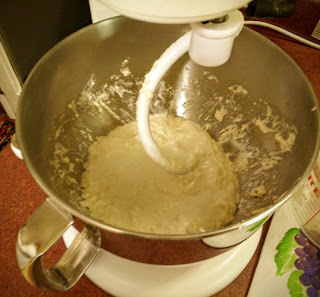 The next day, I made the bread dough and added the poolish to the dough. This dough needed a couple more hours to rise then I created a cloche with a large white dishtowel and allowed the dough to rise again for at least an hour. I heated the stone, a cast iron pan, and the oven to 500 degrees and placed the dough on the stone. Immediately after doing this I added hot water to the cast iron pan which created a steam in the oven. Apparently, professional baking ovens have a push button that will send steam into the oven! I closed the oven door and every 30 seconds I would open the door and spray water against the back and sides of the oven to create more steam. This was repeated 3 times, then I lowered the oven temperature to 450 degrees and the bread was allowed to bake for 20 minutes. The finished product was not bad for a first time but room for improvement. The bread crust was crisp, not too tough, and the flavor was very good! Needless to say, I'll be baking more bread very soon!